How did a small town northern Alberta farm boy wind up in a leadership role at one of Calgary’s up-and-coming tech companies? For Reg Ouellette, the path from chasing chickens in Girouxville, Alberta (population 200) to Vice-President Partnerships and Enterprise at chata.ai was anything but direct. “I’ve done so many odd jobs in my life,” says Reg Ouellette with a laugh from a meeting room at the The Edison in downtown Calgary, which chata.ai calls home. 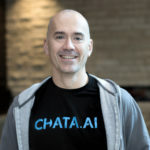 Eventually a Bachelor of Science degree in psychology from the University of Alberta followed by a diploma from SAIT in computer technology led to his first programming job at Shaw where he stayed for 17 years before joining the team at chata.ai. That’s why he sees chata.ai and the work it’s doing – helping users access, search and analyze their data using their own words – as so promising. For example, a potential user might ask chata.ai: ‘what’s my revenue’ this month?’ Another person would understand that the user is talking about total revenue, but the computer application might not. This ambiguity – and how the system should interpret and make sense of it – needs to be programmed. The potential for a data analytics tool using natural language is incredibly vast, Reg believes. It’s why he joined chata.ai he says, because he saw the potential in so many different markets. 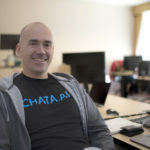 As a leader at this start-up SaaS (software as a service) company, Reg is focused on getting chata.ai to new markets and building an exceptional product. Although this doesn’t require as much heavy lifting as chasing chickens or dodging bee stings, helping chata.ai grow and chart a path requires plenty of hard work, flexibility and quick thinking. Reg is definitely up for the task.